4E's Novelty Rainbow Coil Spring Giant Slinky, Great Toy for Kids Bright Colors Large Slinky Birthday Gifts for Kids Boys Girls, 6"
✔️ We can argue all day about all things in the world but we all agree to the fact THAT KIDS LOVE SLINKIES, BIG AND SMALL, MIXED COLOR AND SINGLE COLOR. There is no better way to bring joy to a kid's heart then to give him a big coil spring slinky. A slinky is a toy that captures the imagination of a child. And lets face it, we can other times find ourselves, mature adults, engrossed playing with a slinky, a slinky has a captivating power and an amazing playfulness capacity. ✔️ Delight the children in your house, or your friends, by buying them THIS HUGE COIL SPRING SLINKY, FROM THE TOY EXPERTS AT 4E'S NOVELTY. 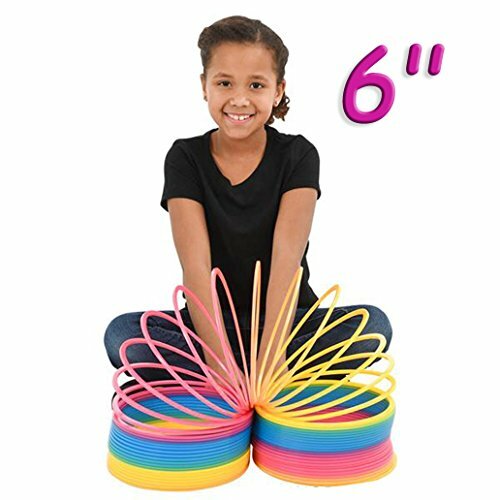 This slinky is huge and super playable, it's made of durable stuff that won't break or get kinked and unusable, you children will enjoy hours of fun with these Coil Spring Slinkys playing under the beautiful summer sky. ✔️ WOW 6 INCHES... THIS COOL COLORFUL COIL SPRING SLINKY IS A PERFECT GIFT IDEA FOR YOUR CHILDREN OR YOUR SMALL LOVED ONES, friends, nephews and nieces and kid friends on the street they will be very happy and appreciative. ✔️ You can bet the bank on us, THAT YOUR CHILDREN WILL SPEND HOURS PLAYING WITH THESE SUPER COOL COIL SPRING SLINKIES, TURNING THEM AND TOSSING THEM, running them down staircases, making decorative links and chains and just tossing them from hand to hand.